Philosophy is weird. Not bad weird but just weird. It's an amorphous field of study. Even Merriam-Webster's definition of philosophy is sort of all over the place, "the study of ideas about knowledge, truth, the nature and meaning of life, etc." (Like "etc."? Seriously Merriam-Webster? That's about as effective as adding "Or y'know, whatever.") There are infinite ways to speculate about the meaning of life, what humanity is, and how we should operate. 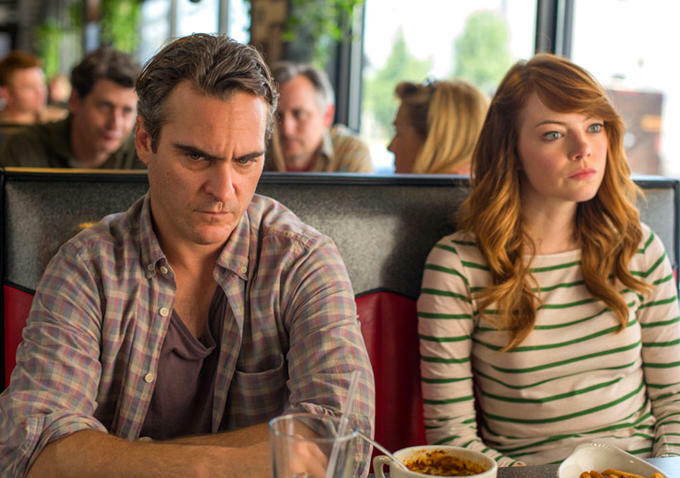 Woody Allen's latest, Irrational Man, takes a closer look at the moral ethics sect of philosophy and dives right in. 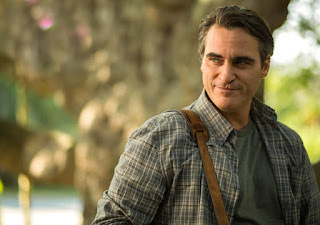 Irrational Man follows a middle-aged college philosophy professor named Abe (Joaquin Phoenix). Abe is in the doldrums when he arrives at his new post at a small made-up college in New England. He's lost his zest for life, all he ever seems to do is drink, and he is completely self-absorbed in a kind of depressive funk. He ends up befriending one of his students, a girl named Jill (Emma Stone), who finds his philosophy fascinating and ends up falling for him over the course of their friendship. But Abe's doom and gloom view of life takes an odd turn one day when they're hanging out at a local diner and overhear a conversation between people that they've never met. After making up his mind to commit an unspeakable act for the greater good, Abe makes a complete 180 and becomes a sunny, upbeat person who embraces everything life has to offer. But will he actually commit the crime? And what are the real-life consequences if he does? Looks like a totally rational man, right? Well, spoiler alert: he's not. For someone whose films are generally made for a sort of lofty, educated (one could even say snobby) kind of audience, Allen takes an interesting look at not only human nature but also the nature of philosophy in general. Throughout the movie, we're given snapshots of Abe's talks on philosophy, objectifying human nature and making theories about the way people are supposed to be living their lives. It's speculative. He even says it himself at one point that "Philosophy is mostly just verbal masturbation." But what's even more interesting as the film moves along is the way that this affects his actions. Determined stop being a bystander in his own life, Abe tries to make his own philosophy a reality. But experience steers him wrong. As a philosopher, Abe makes sweeping, general observations about the human race, but without taking into account what an individual human life really is. In fact, despite his own admission that philosophy is mostly objective, his fatal mistake is over-objectifying humanity. By seeing one person as a scapegoat for a bigger world problems, he's fueled to make a decision that he thinks will better humanity. But he does it without seeing the reality of what a human life actually is, with all of its bits and pieces, its connections, its routines, its emotions. And without realizing the larger futility of the one act itself. Opposite Abe him is the ever-fabulous Emma Stone as Jill, a naive student who ends up having to make some interesting choices regarding her and Abe and their relationship together. Jill is captivated by his stances on human nature, but it's noted even early-on that she disagrees with a lot of what he says as well. As Abe bcomes more tangled in his own ideas, Jill provides the reality check for us all, and Stone's acting is stupendous. Honestly, even if you don't want to delve into the ethics of morality, the movie is a beautte. Phoenix and Stone are impeccable actors and this movie really allows them to play to their strengths. Phoenix is great as the totally self-absorbed philosophy professor and Stone plays the college student with a staggering amount of sincerity. 8.5 outa 10. The movie is one of the most thought-provoking I've seen in a while. An interesting delve into the world of moral ethics and how we define right and wrong. I love Joaquin Phoenix and Emma Stone, I was really excited to watch this film and I'm really glad you liked it! Looks like it should be an interesting one, great review!